Time Off and Absence Management features allow employees to track available time off balances, request time off, and have requests approved by multiple and backup approvers. 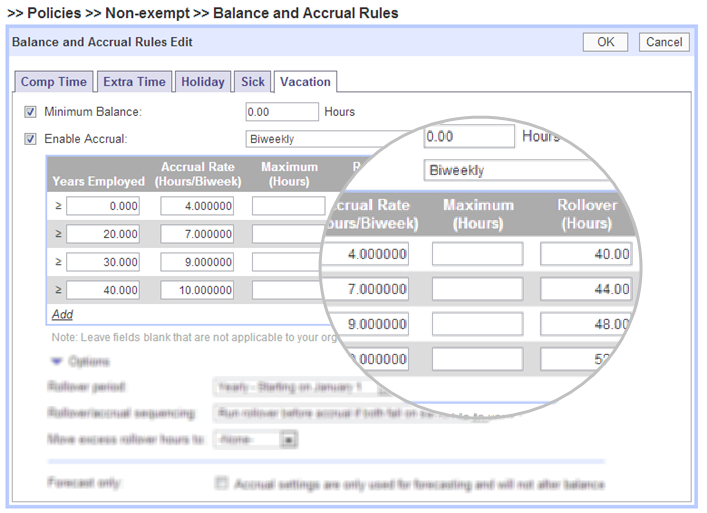 When making requests employees can see forecasts of future time off balances. The system can support multiple holiday schedules made by locale or country groups. Email notifications notify approvers of new time off requests, and tell employees when requests are approved or rejected with detailed reasons. Request approvals can be escalated to backup approvers when approval deadlines are missed. Time off balance and accruals rules for any time period: weekly, biweekly, semi-monthly, monthly or yearly. Custom rollovers for any time period, maximum balances or caps, and minimum balance rules. Employee can fill out a new request while being reminded of their available Time Off balances before they submit a request. Employees can drill into a rejected request and learn the reasons for the rejection. Multiple managers can approve or reject Time Off requests. Employee Time Off balance information and approval status or rejection reasons are displayed on the approval screen. Time off requests automatically notify approvers that there is a new time off request to approve. Time off aproval reminders can be triggered to go out a day or two later and Time off approval late notices can be sent each day until it is approved.